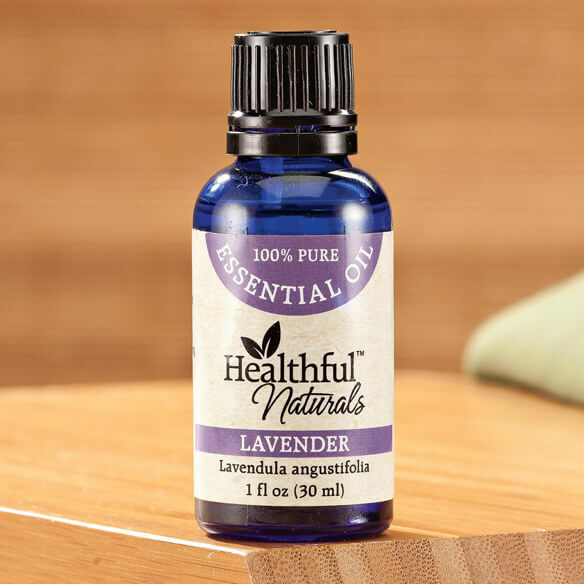 Calming Healthful™ Naturals lavender essential oil naturally helps promote relaxation. Long used to improve restful sleep, French lavender oil is distilled from the flowering tops for a soft, powdery floral scent. Perfect for promoting overall skin health, its therapeutic properties often are used to ease muscle tension and help heal minor wounds, burns, insect bites and itchy skin. Use for overall skin health and to treat minor conditions. Calming pure essential oil naturally helps promote relaxation. The only essential oil safe for undiluted use. A natural antispasmodic that blends well with other oils. Dilute in water for aromatherapy or carrier oil for topical use. For topical use, dilute in a carrier oil such as jojoba, coconut or olive oil first. For aromatherapy or topical use. i USE THIS WITH A DIFFUSER THAT I PURCHASED HERE AT EASY COMFORTS AND IT WORKS GREAT. I HAVE ALL 6 OILS AND THE PEPPERMINT WORKS WELL TOO. iT HELPS WITH MY STUFFY NOSE ALSO. I love this oil. Not only does it relax you and your dog, it can be used as an antibiotic. It is effective. I mix it in a bottle with water and spray it on my pup or just to freshen the air and it always relaxes us. Love this essential oil, and great fragrance. My favorite fragrance and essential oil for both use in an aromatherapy diffuser, as well as mixed with a grape seed or jojoba oil for massage therapy. I use it in a air fresher, sleep better at night. I use this product with the diffuser and it makes my home smell nice but also a relaxed atmosphere. Found out you can mix lavender oil with other oils from Walter Drake's in which I ordered to try can't wait to try it. Nothing bad about it. I rub this where I get my headaches and it seems to soothe them away, I all so use under my sheets to relax my legs at night to sleep, I put the oil on a dryer sheet and slip it under the fitted sheet. I have ordered this brand a lot and I love it in my Diffuser and the aroma is wonderful. We use an infuser daily. The lavender helps my husband relax & sleep. Lavender relaxes you. I love to use it on my light bulbs. I love the smell of lavender and it has special meaning to me. Long time ago I had some of this and I want to try it again. Have used before. It is a good product that works for me. The price is good and I only buy items that have free shipping. HOPING IT WILL GIVE SOME KIND OF WONDERFUL ODER IN MY HOME. Works great for my migraine headaches. Put a few drops on a cotton ball and rub into the area. Works wonders! Also, if I've had a stressful day sprinkle some into bath water! This is a repeat of this Essential Oil. I love the aroma and I like mixing with the Essential Oil, Lemon scent. Need it to make own shampoo. The scent of lavender is suppose to aid in sleep. I'm hoping.